The Executions tab displays all executions for the current day in the data grid. The current day's execution information will be shown in the data grid when connected to your brokerage connection. Simulated trades (into any simulation account) will appear when connected to any data feed connection. Executions on currency pairs that do not contain USD will try to grab a conversion rate in real-time shown in the "Rate" column from your data provider. Should a suitable USD conversion rate not be available, a rate of 1 will be used. This Rate will be used in determining the PnL in USD for the forex trade in other areas like the Account Performance tabs. The approach NinjaTrader follows is the GAIN Capital approach, but may differ from what banks do since they base their conversion rates off of the prior session's closing price of the currency pair. This means that our calculation approach may result in slightly different PnL values than the ones reported from your brokerage. Note: NinjaTrader connection setting "Auto subscribe to required instruments" must be enabled when creating your forex connection for NinjaTrader to automatically get the currency rates needed for PnL conversion when the trade execution occurs. For more information please see the connection guide for your provider on how to enable this property. Executions track the Account Lot Size used for the account when the execution occured. This is used for accurate Pip PnL calculations as a 1 pip gain in EURUSD for a 10,000 QTY sized mini lot trader is different then a 1 pip gain in EURUSD for a 1,000 QTY sized micro lot trader. Account Lot Size is used by NinjaTrader to normalize your Pip PnL reporting so that it is accurate to your accounts base Forex lot size. 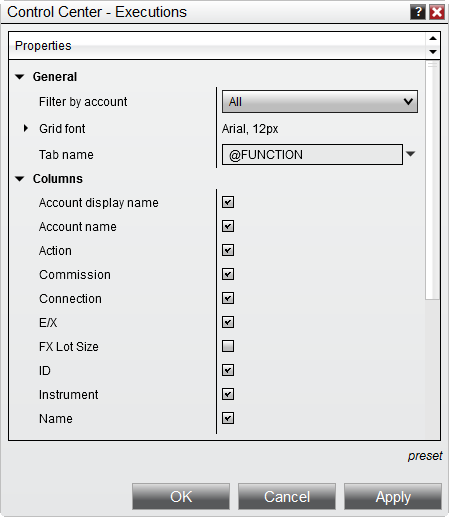 The Account Lot Size is normally provided from your broker automatically, however if the broker does not send the account lot size then the connection settings for the account in NinjaTrader will have an option for you to define the property "Forex lot size". 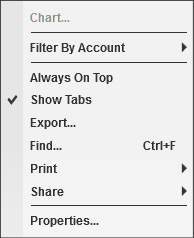 Sets that columns are enabled or disabled in the order grid.